Simplified Campaigns is about giving you the tools so you can build a campaign strategy that helps you share your message in the most effective and cost efficient way possible. 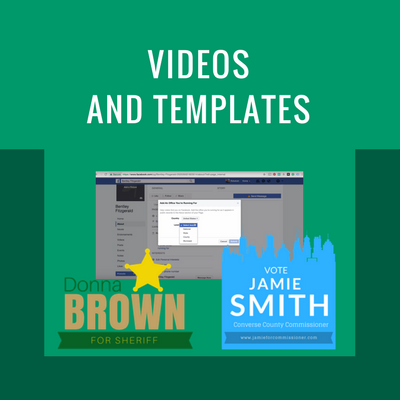 That's the goal and that's why I created a convenient, inexpensive online resource collection of workbooks, templates, videos and files to help organize your campaign. Sounds cool, but how's it going to help? The resource collection includes checklists, budgeting spreadsheets, branding workbooks, call templates, videos and more. These are all things you will need for your campaign but won't have to start from scratch. Items range from printable PDFs, to Google documents, to Canva templates. And *NEW* two live Q&A calls per month. What's even better is items are added each month, which means the resources keep expanding. Access to the 12-Month Campaign Planner ($47 value included for FREE). Access to the Create Your Own Campaign Logo course ($57 value included for FREE). How often is the collection updated? Monthly. Each month 4 new items are added. Subscribe or unsubscribe when you want. Keep in mind the pricing can always change and staying subscribed keeps you locked in to your current price. Can I give access to my campaign manager or staff? Yes, please do! These resources are available to advance your campaign. So they are for you, your campaign manager, your staff or volunteers. Whoever you want to have access please share the log-in information with them. I want access for the duration of my campaign are there longer subscription options? Yes, you can get access for an entire year at 12 months for $200. I don't see a step by step for how to fill out the templates, why not? I want to help you advance your campaign. By providing resources and templates in the Resource Collection it allows me to offer some of my resources for the ultimate DIY campaigner at a reasonable price. If you are looking for the "how" to fill out a template and accountability for building a plan, that's covered in my courses. Meanwhile, this resource will continue to provide a wide variety of content at an affordable price. Log in to see when the next live Q&A is scheduled. Leave a question and I'll answer it or join live where I'll be answering any questions you have about moving your campaign forward. Each live session will be up-to an hour in length and recorded. What if I have an idea for something new? Please contact me, I love hearing what you need! You are looking for templates and workbooks on topics like fundraising, outreach, budgets for an affordable price. You like DIY or working your way through a spreadsheet or template on your own. You're looking to move your campaign forward. You are looking for an in detail step-by-step on how to do something. You are not interested in working through new material on your own. You're comfortable where you're at with your campaign.